A small group of Datchet Village Society members is researching the lives of soldiers listed on the WWI memorial on the village green. Our intention is to find out more about each of these soldiers, their families and their life in Datchet, as well as to learn about their experiences of war. We are very keen to hear from anyone who has any information or photographs about any aspect of life in Datchet during WWI. Please contact us here. We’re learning a great deal about the men behind the names on the memorial; about the florist killed on his first day at war; the local bobby who joined the Coldstream Guards; and the post office worker awarded the Military Medal. We’ve discovered the story of an officer buried by the Germans during the Christmas truce; read the diaries of the church organist who was reported wounded and missing; and we’re tracing the story of a former stable boy who tried his hand at rough-riding before joining up. We’re finding out more about these soldiers’ families too: the grandparents with 10 grandsons at war; the poverty-stricken widow who put her sons in a home for destitute children; and the parents travelling to France to see their dying son but who arrived a day too late. Importantly too, we’re unearthing records of local men who gave their lives for their country but who aren’t remembered on the memorial, and discovering instances where the wrong family member has been commemorated. 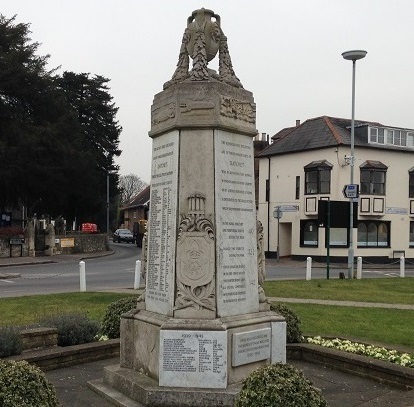 After the war ended, Datchet’s War Memorial committee clearly intended to make some public record of all those who had served during WWI, but the compilation of a definitive War Roll was abandoned. 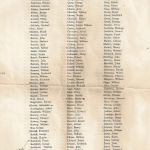 The incomplete list, which you can see here, records the names of 350 men. As we research the different families in the village, we are discovering quite a number who are missing from this list. Over time, we hope to be able to create a more comprehensive War Roll and perhaps add missing names to the memorial. (To avoid confusion, we are calling this list the War Roll rather than a Roll of Honour since the latter has come to imply lives lost.) 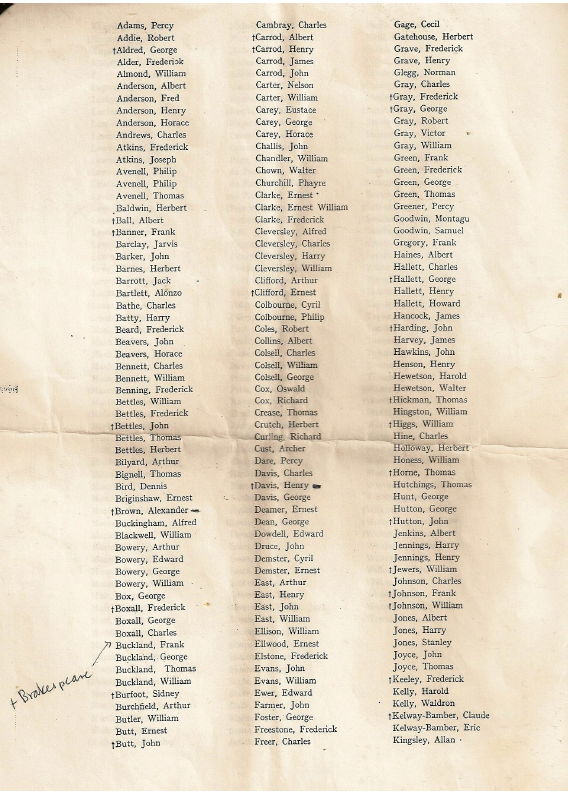 We are very keen to hear from anyone who has any information or photographs about any of the men remembered on this list. Please contact us here. 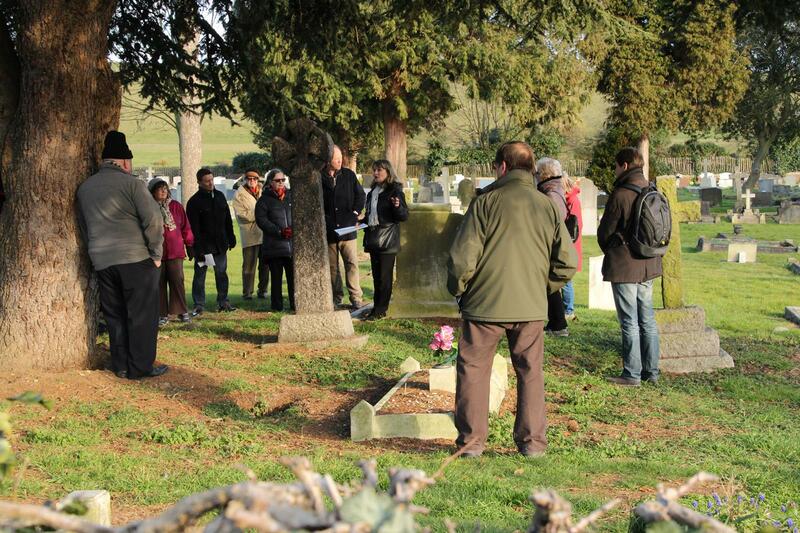 Who were the WWI soldiers remembered in Datchet’s cemetery? 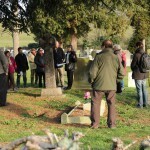 There are at least 10 graves or memorials dedicated to the men who fought in WWI, some only recently rediscovered. The DVS purchased this special plaque for the village and for our Datchet in WWI project. 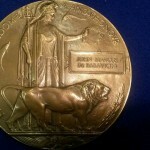 These bronze Memorial Plaques were sent to the families of all men and women who died during war service. They are about five inches in diameter and, as they look like a large medal or coin, were often called the ‘Dead Man’s Penny’.